For Christmas, the quads received a generous monetary gift from a dear family friend to be spent on activities. Originally I intended to buy a family membership to the zoo or children’s museum. I did some preliminary research and decided memberships weren’t prudent since the quads have free admission most places until their third birthday, which isn’t until July. 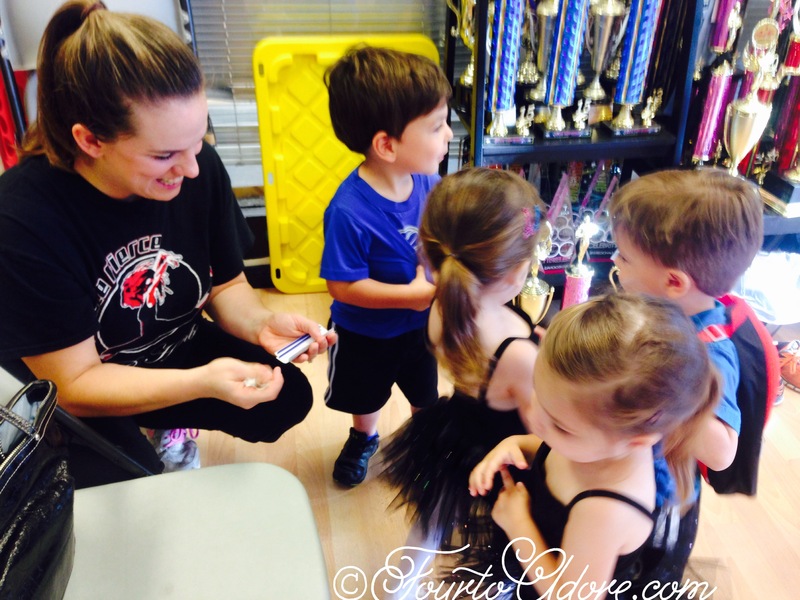 When I found a dance studio offering summer dance lessons buy one, get one free I decided it would be a fabulous way to use the gift. 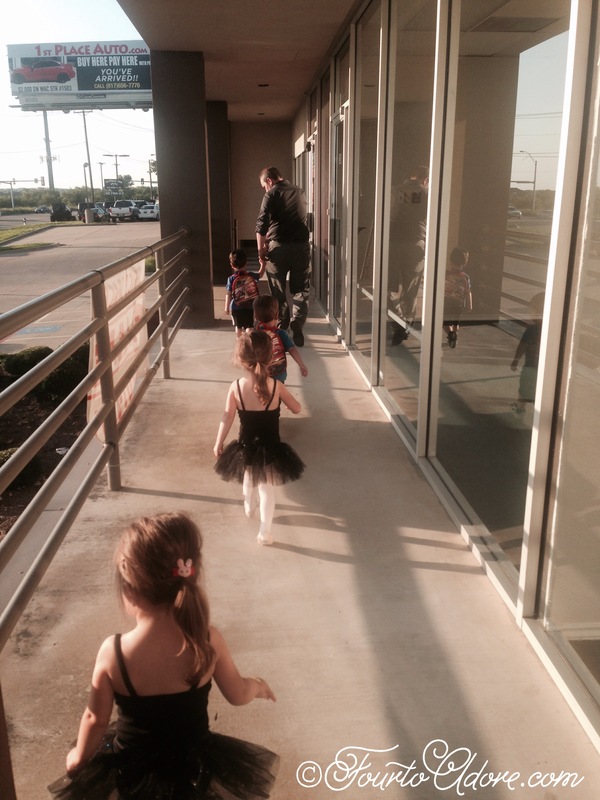 Long before the quads arrived, I hoped to one day enroll my own children in dance lessons, and recently I’d begun thinking of enrolling the girls when they were ready. Though I’m not planning on keeping the boys in dance lessons (unless they request them), I figured it would be a fun summer activity for all four, and an excellent opportunity for them to practice gross motor skills, following directions, and being separated from us while also being away from home. I allocated about 30 minutes to get everyone ready for class, and felt accomplished when everyone donned dance garb in 15 minutes. That pride faded when I noticed Harper removed his shoes and Rylin pulled her hair out. At times like that, I feel as though I’m in a constant game of Whack a Mole. As quickly as possible, I put Harper’s shoes back onto his chubby feet and re-styled Rylin’s hair before ushering everyone to the van. Much to my surprise, we arrived at the studio in ample time for me to complete registration and pay for lessons. Once everything was settled, the quads waited with me for their class to begin. More importantly, they did a stunning job staying seated the entire wait. Sydney is fascinated by taking selfies and snapped this photo during the wait. She really has a knack with the camera, sometimes snapping better photos than me. When it was time for class, the quads were called by name and given a name tag. 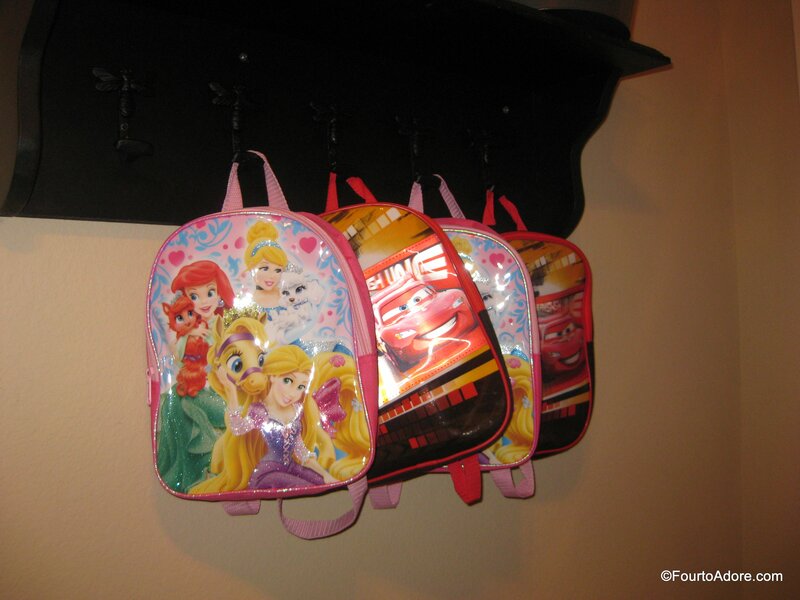 Then, they were led into the studio and were assigned a cubby to house their backpacks. Once they were settled, I made a quick escape so they could attend to the teachers. Rylin was notably hesitant to participate, and I knew if I lingered she’d cling ferociously. I didn’t hear any screaming or crying, which I figured was a good sign. 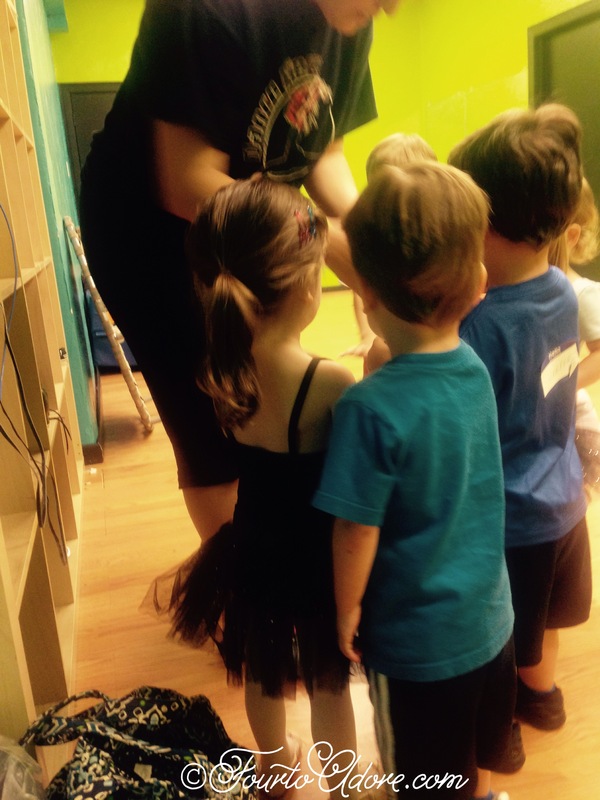 Towards the end of class, parents were invited to the studio to watch the kids demonstrate the “freeze dance”. Of the four, only Mason and Sydney were willing to partake in this demo, and they seemed to be thoroughly enjoying themselves. Rylin outright refused even with me cajoling her and Harper seemed oblivious as to what he should do. At the conclusion of class, each of the students received a sticker. Rylin wasn’t keen on dancing, but she was rather articulate about which sticker she wanted, and where it should be placed (sigh). Though I was responsible for getting the crew to dance lessons, George met me at the studio after work and helped me load the van for home. 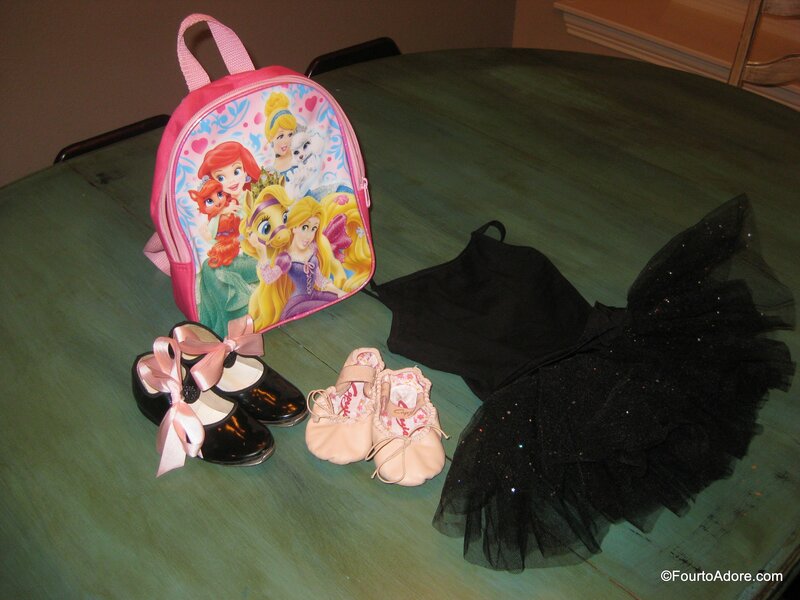 As we approach the next dance lesson, Rylin’s been telling me she has no intentions of going. I sincerely hope she’ll fall into place when she sees the other kids. The boys are humoring me with these dance classes, but on several occasions Harper blatantly stated, “I’m doing baseball in the fall!” I’m not sure he knows what baseball, or t-ball entails, however. What extracurricular activities did you enjoy as a child? Did your parents force you to participate in any? PS- If you can’t get enough of Four to Adore, don’t forget to follow us on Facebook, Twitter, and Pinterest! 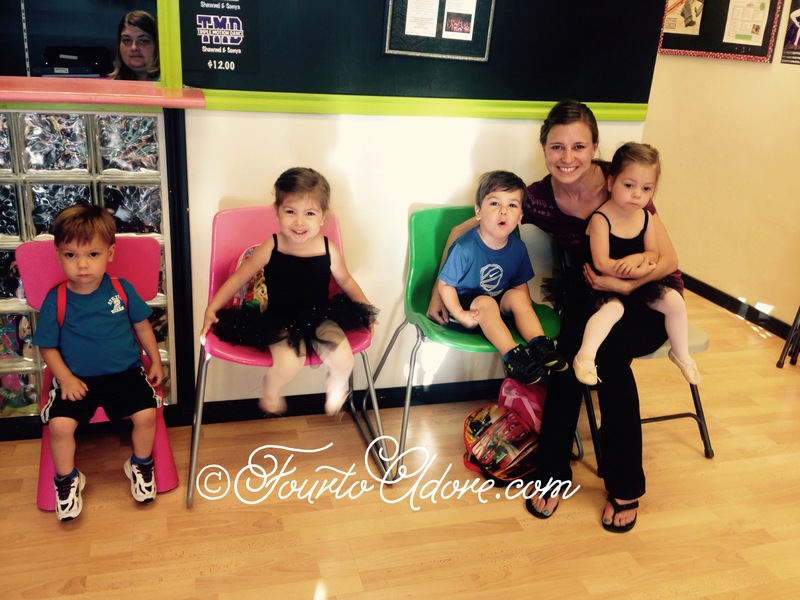 They are so cute in their dance gear, especially the girls in those black tutus! Love it! 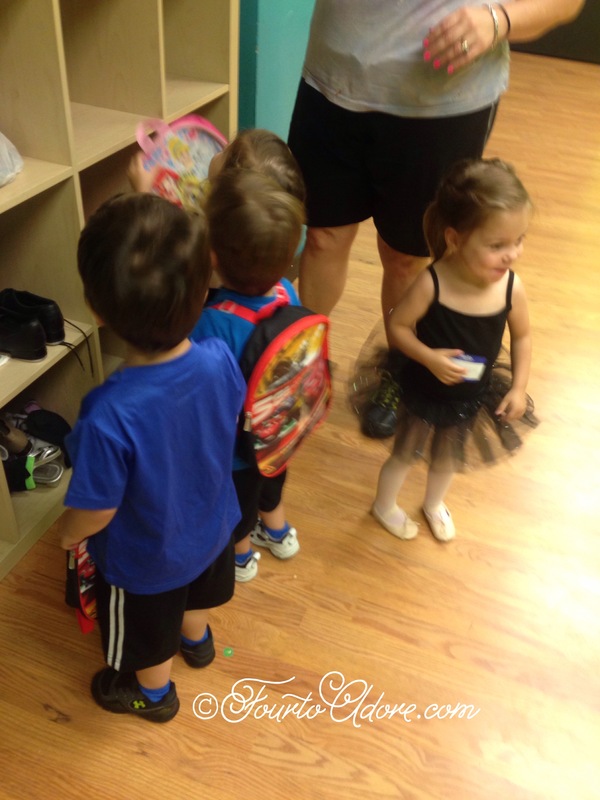 They are cute in their little tutus!! I had to do dance and piano growing up, and in middle school I asked to do martial arts instead of dance (I’m not so graceful for dance but I was good at martial arts). I want the kids to start taking piano lessons when they’re 4, that’s when I started and I think it is a good skill to have, there is so much you learn when you learn music. So that’s my only “plan” for them, I guess! 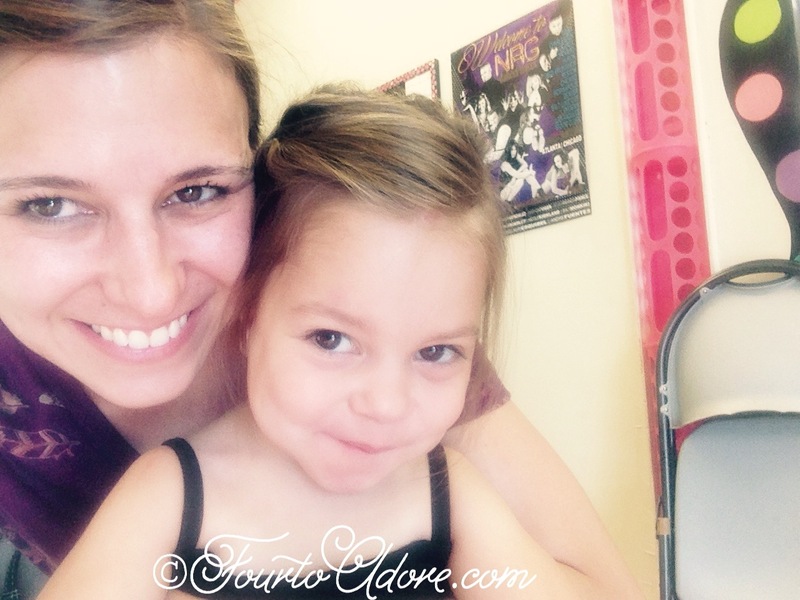 My friend wants me to put the kids in dance with her daughter but I’ve been hesitating! 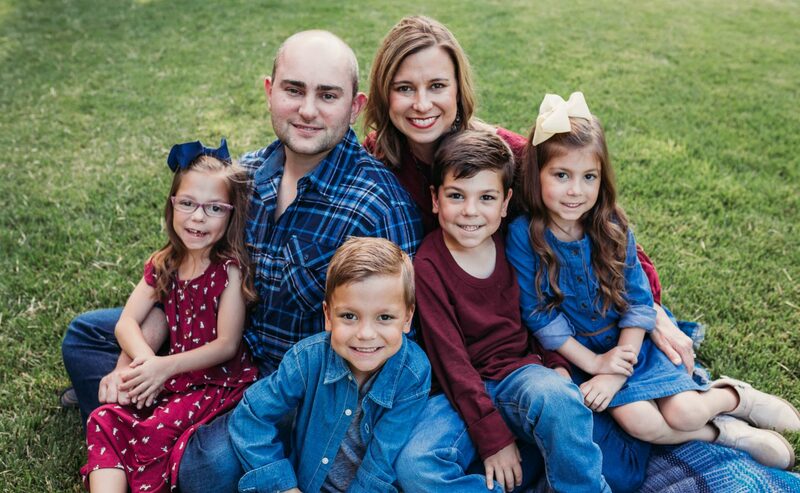 I think we parents like to enroll our kiddos in the things we enjoy, but it’s so much better when kids are old enough to determine where their own strengths and interests lie. I can only hope that the quads will do me a favor and at least pair off with activities….I’m not sure how we’d manage going four different directions!!! Music is very good for activating areas of the brain that impact social and academic development. I’m a middle school band dropout….I am totally tone deaf and not musical at all! I think Sydney has potential with music though, she’s been carrying a tune since she was about 18 months old, and remembers lyrics really well. You must be one proud mama! Four separate dances at age ten is a huge deal, along with competitions. I didn’t do that many until middle school, and even then it wasn’t easy to master several routines. I know my parents had such fun watching us at recitals over the years, and I hope the girls will want to continue dancing. 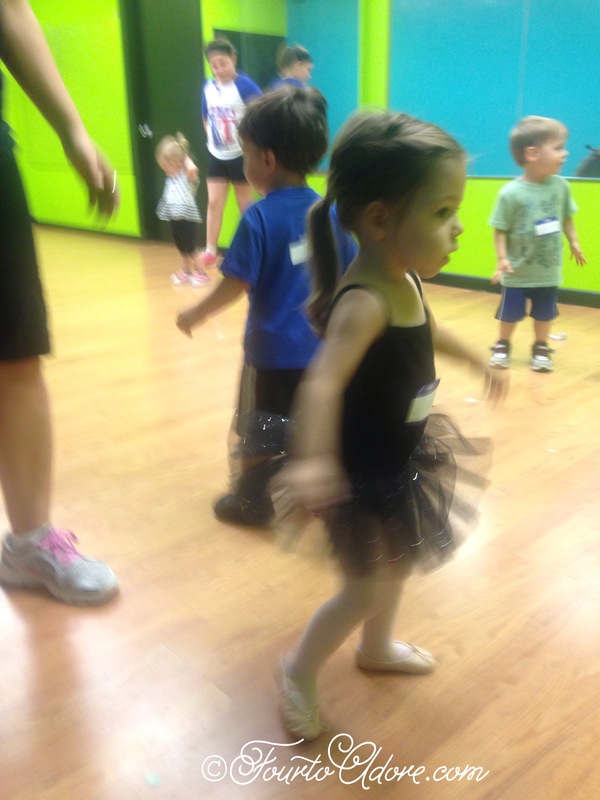 I hope your little one has fun dancing!! !